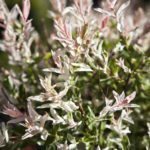 While common snowberry shrubs (Symphoricarpos albus) may not be the most beautiful or best behaved shrubs in the garden, they have features that keep them interesting throughout most of the year. The shrub blooms in spring, with small but dense clusters of bell-shaped, white flowers at the ends of the branches. In fall, the flowers are replaced by clusters of white berries. The berries are the showiest feature of the shrub and last well into winter. Plant snowberries in full sun or partial shade. The shrubs are found naturally along stream banks and in swampy thickets, but they thrive in dry areas as well. They tolerate a wide range of soil types, and while they prefer clay, they also grow well in sandy and rocky soils. Snowberries are rated for USDA plant hardiness zones 2 through 7. Snowberries are an asset in wildlife gardens where they provide food and shelter for birds and small mammals. Bees, butterflies, moths and hummingbirds are attracted to the shrub. They also do well in exposed areas where they tolerate strong winds. Vigorous roots make the plants suitable for soil stabilization on hillsides and stream banks. Even though wildlife enjoys eating the fruit of the snowberry bush, it is poisonous to humans and should never be eaten. Some experts claim that you can eat the berries if you pick and cook them at just the right stage of maturity, but it’s a risk not worth taking. Snowberry bush care is intensive because of the vigorous suckering and the numerous diseases that infect the plant. Anthracnose, powdery mildew, rusts and rots are just a few of the problems that infest snowberries. Pulling up and cutting off suckers is a constant chore. Keep the soil moist until the plant is established. Afterward, it tolerates dry spells. Common snowberry doesn’t need annual fertilization but will appreciate an application of balanced fertilizer every other year or so. Prune regularly to remove diseased and damaged parts of the shrub. Where diseases like powdery mildew are serious problems, try to open up the shrub to allow better air circulation. Remove suckers as they appear. Read more articles about Snowberry Bush.